We live in a society that demands instant gratification. We are always connected with devices that bring the world to our fingertips. We know more, more quickly, than at any time in human history. And yet we seem to be satisfied less, just as quickly. Leaders are in a quest for more, but the obtaining more seems to result in just wanting more. It is a vicious cycle not easily broken. Church pastors and staff are not immune to this; in fact, in some ways they may even be more susceptible. Congregational leaders and promising opportunities pull pastors in multiple directions at once, resulting in almost constant feelings of being overwhelmed by ministry, and by life. The true, deepest need for leaders today is not to be more intelligent, or more gifted, or even more successful, but to be more connected, more fully to God. The classical disciplines (meditation, prayer, fasting, study, simplicity, solitude, submission, service, confession, worship, guidance, and celebration) of the spiritual life call us to move beyond surface living into the depths of communion with a Holy and Living God. THE QUICK SUMMARY – Living the Quaker Way, by Philip Gulley. Even leaders in the Church are trapped in a maze of competition making spur of the moment decisions of programs or purchasing only to “fit in” or keep up with our friends. Did you REALLY need that new iPhone or were you trying to stay ahead of the youth minister? The Christian discipline of simplicity is an inward decision toward focusing on the higher things of God that results in an outward lifestyle of impressing an audience of One. While our journey toward a simpler life might well take different roads, it begins with the same step— the discernment between wants and needs. Just as we cannot compel someone else to live simply, we cannot define simplicity for another, for our needs vary, as does our capacity for change. The life of simplicity is one of growing awareness, and each of us grows at different rates, in diverse ways. Not many decades had passed before early Quakers began judging one another’s commitment to simplicity, gauging another’s devotion to God by his or her clothing, home, and speech. They then enacted strict rules governing simplicity. It ended disastrously, creating a climate of judgment and self-righteousness that caused grave injury to our spiritual well-being. Simplicity is not a universal fit. What is extravagance to one is necessity for another. My interpretation of wants and needs will not be yours, nor will yours be mine. The life of simplicity does not mean owning a bare minimum of goods. It is a commitment to live a liberated life, freed from constant distraction, devoted to our spiritual and emotional growth and the betterment of others. This can, and will, take many forms, depending upon our priorities, insights, needs, and life stages. There are, the saying goes, two ways to be rich: one is to make more, the other is to want less. Most of us, when given that choice, have opted to make more. The idea of doing without, of denying ourselves the things we want, seems almost unfair. Advertisers tell us we “deserve” to drive a new car or “need” a larger television. It is easy to convince ourselves we merit these things, especially since we have worked so hard. But it is a vicious cycle, for we have worked much in order to buy the things we believe we need, often without stopping to consider whether they are essential. The pursuit of simplicity involves every facet of your life – spiritual, physical, emotional, relational, and vocational. The successful journey of a successful life will lead us from one area to the next. Simplicity should be leading us on a journey in which each month, each experience, and each encounter is a learning opportunity for us. A deeper level of understanding about simplicity should reorient our lives so that possessions can be “genuinely enjoyed without destroying us” (Foster). Gather your staff and personally force-rank the 10 principles above. Once each of you have ordered them from most challenging to least challenging, compare your lists. Now pray together and become accountable when you share similar challenges and pray for others who might be weak in area in which you are strong. Allow others to pray for you in your weakness. Leo Tolstoy said, “Everybody thinks of changing humanity and nobody thinks of changing himself.” The needed change within us is God’s work, not ours. The change demands an inside job, and only God can work from the inside. Following the spiritual disciplines prepares your inner being for the change that only God can bring. Excerpt taken from SUMS Remix 34-2, published February 2016. …a single iconic image can be the most powerful form of communication. Ken Segall was the creative director at several ad agencies, working for big-name tech companies like IBM, Intel, and Dell. However, it was his work with Apple over a period of years that gives him a unique perspective of the stark contrast of Apple’s ways that made Segall appreciate the power of Simplicity. The obsession with Simplicity is what separates Apple from other technology companies. Led by Steve Jobs’ uncompromising ways, you can see Simplicity in everything Apple does: the way it’s structured, the way it innovates, and the way it speaks to its customers. 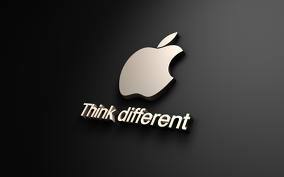 Apple branded itself using iconic images and two words that perfectly described the spirit of the company. Every Apple produce sold contributed to the brand image; every product became a manifestation of the brand. One is the simplest number ever invented. It’s so simple, a child can understand it. The further you get away from one, the more complicated things get. That’s why Steve Jobs insisted on iPhone having only one button, rejecting many models before arriving at the final version. You don’t even have to use an iPhone to get that it’s simple. In fact, one could say that the single button has become an icon of Apple’s devotion to Simplicity. If Apple had it’s way, all of its products would feature a single button. Now that the iPhone has Siri, the voice-controlled assistant, you might want to prepare yourself for Apple products with zero buttons. After all, zero is the only number that’s simpler than one. I’ve really enjoyed reading Insanely Simple and its true insider’s perspective on Apple’s obsession with Simplicity. Ken Segall has really brought the concepts of Simplicity home. As a leader, are you practicing Simplicity? Former ad agency creative director Ken Segall’s new book Insanely Simple is written from a unique perspective: developing marketing campaigns for technology giants like IBM, Dell, Intel, – and Apple. It was the stark contrast of Apple’s ways that made Segall appreciate the power of Simplicity – and inspired him to help others benefit from it. The best illustration of this comes from an example of Segall’s work with both Dell and Apple on similar ventures – developing a new branding campaign. Apple set out to create a brand campaign in 1997. Dell set out to create a brand campaign in 2008. Apple wanted to start its campaign immediately. Dell pondered a schedule that would take months. Apple’s brand team was led by its CEO. Dell’s brand team was led by a committee. Apple trusted a small group of smart people. Dell trusted a small group of incompatible people. Apple knew exactly who it was. Dell need to figure out who it was. Steve Jobs was an active participant. Michael Dell would look in when the project was complete. Apple’s brand team required only the CEO’s approval. Dell’s brand team required each division’s approval. Apple took a month to conceive and create a campaign. Dell required a month just to talk about strategies. Apple ended up with the Think Different campaign. Dell ended up with a stack of presentation boards stored neatly in a dark closet. Simplicity – represented in the above example by Apple’s actions – is a fundamental requirement when you’re trying to achieve lofty goals. As Dell discovered, a fractured, leaderless group without an urgent mandate is Simplicity-proof. Will you walk the straight path of Simplicity or choose the dark, winding road of Complexity? Ken Segall was the creative director at several ad agencies, working for big-name tech companies like IBM, Intel, and Dell. However, it was his work with Apple over a period of years that gives him a unique perspective of the stark contrast of Apple’s ways that made him appreciate the power of Simplicity. Segall recently released a book about these lessons – Insanely Simple. More than just another repetition of Apple lore, it chronicles an outsider’s long relationship with Apple and Steve Jobs that will provide leaders in any organization with the powerful tools of Simplicity. While working with Apple, Segall often experienced the strict enforcement of one of Simplicity’s most important rules: Start with small groups of smart people – and keep them small. Every time the body count in a meeting or working on a project goes higher, you’re simply inviting Complexity to take a seat at the table. The quality of work resulting from a project is inversely proportional to the number of people involved in the project. The quality of work resulting from a project increases in direct proportion to the degree of involvement by the ultimate decision maker. To even speak of putting process before creativity did not happen in an environment like Apple’s. A better idea is a better idea – no matter where it fell in the process. The high value placed on ideas is one of the things that Steve Jobs burned into the Apple culture and it will likely continue to guide the company into the future. How would small groups of smart people work in your organization? Blunt is Simplicity. Meandering is Complexity. Clarity propels an organization. Not occasional clarity but pervasive, twenty-four-hour, in-your-face, take-no-prisoners clarity. Ken Segall is a former ad agency creative director who worked for Apple during Steve Jobs’ return to the helm of the iconic tech company. He also worked for many of the largest tech companies around: IBM, Dell, and Intel among others. He’s seen both sides of the fence, so to speak, and it’s not a pretty sight. Insanely Simple: The Obsession That Drives Apple’s Success is an amazing book detailing Apple’s return to brilliance under Steve Jobs. It’s loaded with personal stories and practical applications that your organization will find both fascinating and useful. Like the necessity of being brutally honest in your communications. According to Segall, Steve Jobs told you what was on his mind and he couldn’t care less how you might feel about it. Despite a general perception that Jobs was the nasty tyrant who demanded allegiance, barked commands, and instilled fear in those around him, this was an incomplete portrait. He could also be funny, warm, and even charming. There is a huge difference between being brutally honest and simply being brutal. Simplicity at Apple is the name of the game, and it requires that you be honest and never hold back. If you demand the same from those you work with, everyone will know where they stand. One hundred percent of your group’s time will be focused on forward progress – and there will be no need to decode what people are really saying. Simplicity isn’t just a design principle at Apple – it’s a value that permeates every level of the organization. 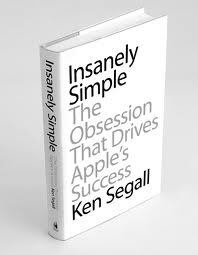 Segall introduces the book with the concept of The Simple Stick – a core value within Apple. Sometimes it’s held up as inspiration; other times it’s wielded like a club. In all cases, it’s a reminder of what sets Apple apart from other technology companies and what makes Apple stand out in a complicated world: a deep, almost religious belief in the power of Simplicity. If you are a leader in ChurchWorld, you know about and fight the battle of Simplicity every day. It may seem like a losing battle, but you need to know that the results are worth the effort. The simpler way isn’t always the easiest. Often it requires more time, more money, and more energy. It may require you to step on a few toes along the way. But more often than not, Simplicity leads to better results. Simplicity needs a champion – someone who’s willing to stand up for its principles and strong enough to resist the overtures of Simplicity’s evil twin, Complexity. To read more about Insanely Simple, go to the top of the page and click on the orange title of tomorrow’s post.